The presence and awareness of chiropractic as a fantastic resource for athletes has been apparent on the world stage for at least a decade. Every single event in the Olympics has a chiropractor in the background giving athletes the competitive edge. Every professional athletic team or club has a chiropractor on their staff to enhance athletic performance. Chiropractic care makes all the difference in performance! Chiropractic care provides really efficient motion in the body and superior efficiency in the biomechanical symmetry of the body. This translates to a brain that’s alert and sharp, which always enhances physical performance. Whether you’re a professional athlete, a weekend warrior or just want a body that works with optimum efficiency, chiropractic is the easy answer. 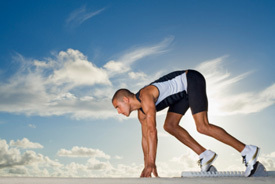 Are you looking to improve your performance? Give us a call to find out how chiropractic can help enhance your body function.